As you may know, our Community Guidelines describe which content we allow – and don’t allow – on YouTube. Your video Operation Good Neighbor: :Israel’s part in Syria.’s civil war was flagged to us for review. Upon review, we’ve determined that it may not be suitable for all viewers and it has been placed behind an age restriction. If a video contains violent or graphic content that appears to be posted in a shocking, sensational, or disrespectful manner, it’s less likely to be allowed on YouTube. We also don’t allow content that’s intended to incite violence or encourage dangerous activities. We review content on a case by case basis and will only make limited exceptions for appropriate educational, documentary, artistic, and scientific contexts, where the purpose of posting is clear. In light of this, we ask that uploaders post as much information as possible in the title and description of their video to help us and viewers understand the primary purpose of the video. Please note, even with this additional context, it’s still not acceptable to post violent or gory content that’s primarily intended to be shocking, sensational, or disrespectful and this type of content is prohibited on YouTube. Learn more here. If you believe this was a mistake, we’d like to hear from you. To appeal this age restriction, please submit this form. Our team will thoroughly review your appeal and will contact you again very soon. For more information on YouTube’s Community Guidelines, please visit our Help Center. Charles Lister says Iran has already won their strategic victory in Syria. A strike by Israel on Iranian ballistic missiles in Iraq would be a major escalation in Iranian-Israeli hostilities, a Middle East expert told The Jerusalem Post on Monday. “Conducting strikes in real mainland Iraq would be a big escalation in Iranian-Israeli hostilities and could very well bring more risks on the Israeli side than we’ve seen before because of the expanded scope,” said Charles Lister, senior fellow and director of the Extremism and Counterterrorism Program at the non-partisan Middle East Institute in Washington, DC. A report by Reuters over the weekend stated that Iran had transferred ballistic missiles to Shi’ite proxies in Iraq over the course of several months and that it is developing the capacity to build more there. The missiles include the Fateh-110, Zolfaqar and Zelzal types, which have ranges of 200-700 km., allowing them to be able to threaten both Saudi Arabia and Israel. While the report was denied by Tehran, Lister told the Post, on the sidelines of the International Institute for Counterterrorism’s annual conference, that “it makes sense” that Iran would make such a move, saying that it was similar to the North Korean model of building a broad range of rockets and missiles to establish deterrence. “The only other thing that would have made sense from a strategic standpoint would be to add Iraq into that equation, particularly given the extent of confidence that the Iranians would have been feeling several months ago about the shape and trajectory of Iraqi politics,” he said. Lister told the Post that Iran has won a strategic victory in Syria despite Israeli operations against them, including the large-scale “House of Cards” operation carried out by the IAF in May, in which jets struck 50 mainly Iranian targets in Syria. That operation sent a “very strong message that the behavior [of Iran] as it was then was totally unacceptable,” Lister said, adding that the psychological affect was greater than any practical damage. According to Lister, Israel is widely alleged to be behind an air strike on the Syrian-Iraqi border in June near the town of Al-Bukamal which killed 22 members of a Shi’ite militia. “If that’s true, that’s a huge statement of intent,” he said. Israel rarely comments on foreign reports of military activity in Syria, but has publicly admitted to striking more than 100 Hezbollah convoys and other targets in the war-torn country. Defense Minister Avigdor Liberman also signaled on Monday that Israel could strike suspected Iranian military assets in Iraq like it has done in neighboring Syria. The Syrian Observatory for Human Rights reported Monday that explosions shook an area in the eastern countryside of Homs after midnight Monday, citing reliable sources saying that they were caused by airstrikes that targeted vehicles of regime’s allies. According to the Syrian Observatory, a column of Iranian Forces and their loyal gunmen of Syrian and non-Syrian nationalities was hit by warplanes of unknown origin—possibly belonging to the US-led International Coalition—as the convoy passed near the al-Tanf area which is controlled by forces of the International Coalition and the Western-supported rebel factions. The attack killed at least 8 of the Iranian force and the militia gunmen—1 Iranian, 3 Syrians and 4 “others,” and injured at least 11. AFP inquired with the Coalition forces whether they were behind the attack but did not receive a response. On Sunday an attack was reported in Syria near the Al-Maza military airport in Damascus, which was attributed to Israel. The Assad regime denied an Israeli involvement, stating the cause for the enormous explosions was an electric malfunction. The Syrian Observatory for Human Rights reported that two military personnel were killed and 11 others were wounded in that attack. American billionaire George Soros’ Open Society Foundation has often been accused of promoting anti-Israeli agenda through left-wing NGOs • Iranian FM confirms Tehran worked with the foundation but says work predated his term and boasts “regulating” it. Iran admitted on Sunday that it had worked closely with the Open Society Foundation, a grant-making network founded by American billionaire George Soros, which has often been accused of promoting an anti-Israeli agenda through left-wing NGOs. According to a report published by Israel’s Strategic Affairs Ministry, Soros has backed a large number of groups affiliated with the boycott, divestment and sanctions movement, which seeks to isolate Israel. The groups have been blacklisted by Israel and their activists are barred from entering the country. In 2016, Soros was found to have donated millions to Palestinian and Israeli organizations that set out to delegitimize Israel through U.S. and EU advocacy. Over the years, he has also supported left-wing organizations in Israel such as Breaking the Silence and the New Israel Fund through the OSF, according to the watchdog group NGO Monitor. A senior Hezbollah commander told the Lebanese media Friday that the Shiite organization is planning to infiltrate Judea and Samaria and carry out terrorist attacks there in the event of conflict with Israel. “A small number of well-armed fighters, who are very familiar with the enemy’s defenses, can infiltrate and enter the West Bank and cause great damage,” the commander said. Hezbollah, whose fighters have been deployed in Syria to support the forces loyal to Syrian President Bashar Assad in a yearslong civil war there, has been given “a perfect training ground for the resistance,” the commander said. The civil war in Syria has provided training “in operational combat in a residential area and an opportunity to test the various weapons. The battle against the takfiri groups [Islamist groups that accuse other Muslims of apostasy] has prepared us for battle with the Zionist enemy,” he said. “The war is coming. Going on this assumption, we are now preparing for battle,” he continued. The commander also noted that more than 2,000 new Hezbollah recruits were being trained every year. On Thursday, the U.N. Security Council warned that violations of the 2006 cease-fire agreement between Lebanon and Israel could lead to a new conflict and urged international support for Lebanon’s armed forces and their increased deployment in southern Lebanon as well as at sea. The council’s warning against “a new conflict that none of the parties or the region can afford” came in a resolution adopted unanimously extending the mandate of the United Nations Interim Force in Lebanon in southern Lebanon known as UNIFIL until Aug. 31, 2019. The U.N. peacekeeping force was originally created to oversee the withdrawal of Israeli troops following the 1978 South Lebanon Conflict. The mission was expanded after the 2006 Second Lebanon War between Israel and Hezbollah, to ensure that peacekeepers could deploy along the Lebanon-Israel border and help Lebanese troops extend their authority into their country’s south for the first time in decades. The French-drafted resolution again urged all countries to enforce a 2006 arms embargo and prevent the sale or supply of weapons to any individual or entity in Lebanon not authorized by the government or U.N. force known as UNIFIL – an implicit criticism of the suppliers of weapons to Hezbollah. It called for UNIFIL, which has more than 10,000 troops deployed in southern Lebanon, and the Lebanese military to analyze the country’s ground forces and maritime assets. The Security Council also commented on the current political situation in Lebanon. Nearly four months after the country held its first general elections in nine years, politicians are still squabbling over the establishment of a new government amid uncertainty over a long stagnating economy, struggling businesses and concerns over the local currency. A day after the US announced it will not give any further funding to UNWRA, the UN agency that aids Palestinian refugees, Israeli officials said the Trump Administration has made clear to them that it intends to see UNRWA closed down altogether and all its functions taken over by other agencies. The US, which is shortly set to issue a report on the whole Palestinian refugee issue, in which it will reportedly state that there are only some 500,000 Palestinian refugees — as opposed to the 5 million-plus claimed by UNRWA — considers that there are only some 20,000 genuine Palestinian refugees outside the West Bank and Gaza Strip, the TV report also said. 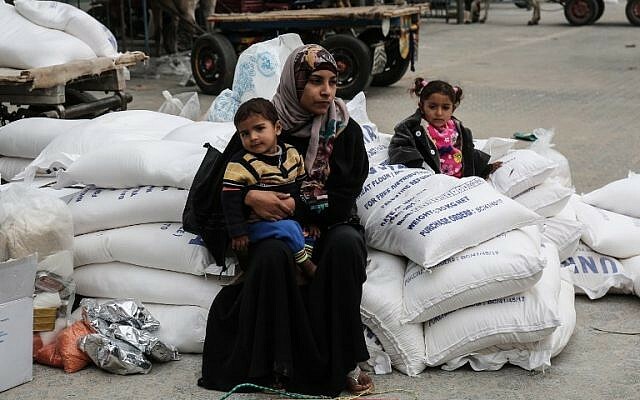 It said the US will now look for other organizations to take on the work done by UNRWA, in education, medical assistance, food aid, and more — with Palestinian recipients acknowledged to be in need of aid, but not considered to be refugees. To this end, the TV report said, the Trump Administration has already asked King Abdullah of Jordan to take over responsibility for UNRWA’s educational network in Jordan — but has been rebuffed. Similarly, it wants Mahmoud Abbas’s Palestinian Authority to take responsibility for UNRWA schools in the West Bank and Gaza — but this idea is a non-starter at present, with the PA boycotting the Trump Administration. Abbas’s PA reacted furiously Friday and Saturday to the US decision to defund UNRWA, and is reported to be examining whether there are ways to work via the UN to block US efforts to marginalize and potentially close the agency. The TV report noted that while Israel’s Prime Minister Benjamin Netanyahu is backing the US in defunding UNRWA, and has called often for the agency to be closed down, Netanyahu is anxious that aid be channeled to needy Palestinians via other avenues, to avoid a further escalation of tension in the West Bank and Gaza…. “I want a three-party confederation with Jordan and Israel and I am asking Israel to accept such a proposal,” Abbas was quoted as saying. The United States presented Palestinian Authority President Mahmoud Abbas with a peace deal based on a confederation with Jordan, the Israeli left-wing organization Peace Now reported on Sunday. The group publicized the possibility of a US-led confederation peace plan after it met with the PA leader in Ramallah. Jordan immediately rejected the idea of a Palestinian-Jordanian confederation, and said the proposal was a non-starter. Shaqued Morag from ‘Peace Now’ meets with Mahmoud Abbas. Jumana Ghunaimat, spokeswoman for the Jordanian government, said Sunday that her country’s position toward the Palestinian cause remains unchanged and firm, and is based on the two-state solution, with the establishment of a Palestinian state on the 1967 borders and east Jerusalem as its capital. Ghunaimat noted that Jordan’s King Abdullah II has long affirmed there is no alternative to the two-state solution. No video or audio clip was released from the meeting. All of the information regarding Abbas’s statements on the Trump plan was reported by Peace Now and the two parliamentarians who were present, MKs Mossi Raz (Meretz) and Ksenia Svetlova (Zionist Union). The Prime Minister’s Office had no response to a Jerusalem Post query on the matter. Jason Greenblatt, the president’s chief envoy to the peace process, declined to confirm or deny Abbas’s claims. ”Over the past 19 months we have probed all relevant parties about many ideas and possibilities,” Greenblatt said in a statement. The United States is hostile toward the Palestinians and wants to “shut down the peace process,” Abbas said. He charged that the peace process was frozen because Prime Minister Benjamin Netanyahu had refused to meet with him. The Russians tried twice to bring him and Netanyahu together, but Israel refused, Abbas told the group. Abbas reiterated that the PA security services coordinate daily with Israel’s security establishment, and that he and his people do everything possible to ensure that no Israeli will be harmed. He added that he also met with the head of the Shin Bet (Israel security agency) on this issue. When it comes to security, Israelis and Palestinians agreed on 99% of the issues, Abbas said. He ended the meeting with a wish for a good New Year and hoped that with God’s help, this would be the year when peace is reached between Israelis and Palestinians. PA officials in Ramallah did not comment on the purported confederation idea. idea. However, they said that Abbas told the Peace Now delegation that the Palestinians’ goal was to establish an independent Palestinian state on the 1967 “borders” with east Jerusalem as its capital. Abbas, according to the officials, said that he supported security and stability for Israelis and Palestinians as part of a two-state solution. If the Trump Administration is looking at the idea of a confederation, it is not the first time the issue has been raised. In 2012, Palestinian Authority officials confirmed to The Post that the PA was studying such a possibility. They added, however, that such a step could only take place after an Israeli withdrawal to the pre-1967 lines and the creation of independent Palestinian state within that border. Earlier this month, Dr. Khalil Shikaki, director of the Palestinian Center for Policy and Survey Research in Ramallah, and Dr. Dahlia Scheindlin from the Tami Steinmetz Center for Peace Research at Tel Aviv University, presented data obtained in June on public opinion with regard to the confederation idea. They asked respondents about a confederation idea which would include residency rights for Israelis within Palestinian areas and vice versa. Some 68% of Israeli Arabs, 31% of Israeli Jews and 30% of Palestinians said they favored such a plan. The concept of a confederation, which would mix sovereign statehood with some aspects of shared governance, has been on the table since the aftermath of the 1967 Six Day War. But Jordan’s decision to disavow any connection to the West Bank and the 1993 Oslo Accords that focused on a two-state resolution to the conflict sidelined initiatives to advance the idea. Speculation has been high with regard to two-state alternatives under Trump because his team has reportedly been thinking out of the box and straying from details of the classic formula that have defined the two-state resolution for over the last two decades.